LONDON — Facebook says it has taken down four pages belonging to rightwing conspiracy theorist Alex Jones, including two featuring his “Infowars” show, for violating its hate speech and bullying policies. The social media giant said in a statement Monday that it also suspended Jones’s account for 30 days because he repeatedly posted content that broke its rules. Facebook is the latest tech company to take action against Jones, the Austin, Texas-based “Infowars” host, after facing growing social media backlash. BuzzFeed News reported Sunday that Apple has removed five of Infowars’ six podcasts from its iTunes and Podcast apps for violating hate speech guidelines. 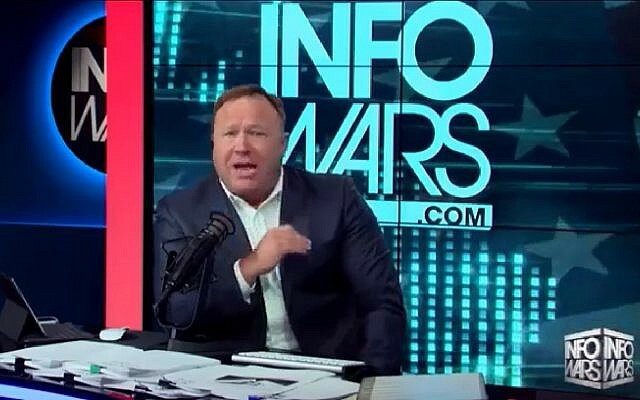 Last week, music-streaming service Spotify removed some episodes of “The Alex Jones Show” podcast for breaching its hate content policy. Among his claims is that the 2012 Sandy Hook Elementary School mass shooting, which left 20 children and six adults dead, was a hoax. Families of some of the victims have sued him for defamation, and he now admits the shooting occurred, but says his claims were free speech. The parents of 6-year-old victim Noah Posner said last week that they had been forced to move homes seven times because of harassment from conspiracy theorists, including Jones.